Home » Product Information » Electric Dampers – Why Lose When You Can Save? Electric Dampers – Why Lose When You Can Save? Bringing down the energy consumption in times of reduced income, and increasing energy costs would be a top priority in every household. If you are serious about helping yourself on this equation, start a thorough inspection of your house, the HVAC system, the electric and electronic equipments that are power consuming, insulation and all that consume energy. Having your old electronic equipment replaced with energy efficient new technologies and installing energy efficient home control solutions would reap you positive returns in the long run despite initial investment. We can take advantage of the government initiatives by using green technologies and materials that cut down our power consumption while saving on energy expenses month over month. Good HVAC systems can save you a substantial amount of money that you would otherwise have spent on the energy wastage from your unit and if you intend to cut down on a good share of your energy consumption, a well installed ventilation system that uses an electric damper to regulate the air flow through the home is one good solution. By installing electric dampers from FAMCO, the HVAC system inside the home will find the best possible means of filtering, regulating and monitoring the air flow in and out of your home at the optimal level, thereby bringing down your energy expenses. A FAMCO HVAC electric damper can be so installed that the airflow can be regulated, restricted and adjusted as per requirements in all areas of the home. Areas of the home that are not often used or lived in, need periodic venting when venting is not possible at all times as unused rooms can become stagnant with foul air and can turn stuffy, warm and stifling. With a FAMCO electric dampers, you can regulate the temperature, humidity and air flow in the room even before you enter it or can have it periodically ventilated. The FAMCO electric damper comes in open and close models, the ADC – normally closed with power open and spring return and the ADO – normally open with power close and spring return, operate on a switch mechanism that knows when the desired level of comfort has been reached. With a FAMCO electric damper in place the airflow to particular rooms can be regulated or restricted thereby saving energy that would otherwise have been wasted which of course is an energy saver. The FAMCO HVAC electric dampers have multi-blade options that operate on a spring that returns the blade to its original position with the power open/close option that operates on 24 volt or 120 volt motor. A flow control adjuster that can open or close the damper blade 100% is found in all FAMCO ADC and ADO units that do not have an end switch. 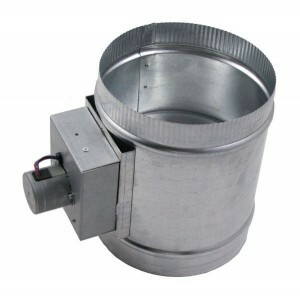 The electric dampers that have end switches cuts off power when the damper has reached its full power position, open or close, and the floating motor mount design assures proper alignment of motor, shaft and damper to prevent binding. The clutch/coupler present in the FAMCO electric damper reduces the number of moving parts thereby prolonging its service life.